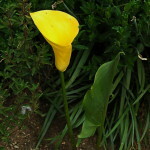 The Mapoch lily is a deciduous plant, up to 0.6 m tall. Beautiful, lemon-yellow flowers are borne in November. Plant in a sandy soil in full sun. 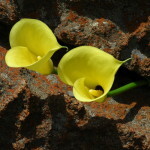 Zantedeschia pentlandii, also known as the Mapoch lily, is a deciduous plant, up to 0.6 m tall. Beautiful, lemon-yellow flowers petal like spathe has a dark purple blotch in the centre and are borne in November. Plants often grow in dense colonies wedged between rocks.The species is restricted to the Mapoch region of Mpumalanga, mainly in the Roossenekal district. It needs full sun to flower. Bulbs are contractile so put a small stone below the bulb before you plant it. Zantedeschia pentlandii needs full sun to flower.